A youth group in Hawick is encouraging people in the Borders to apply for a share of almost £300,000 from our Localities Bid Fund. 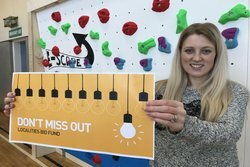 Escape Youth Services was awarded £8,000 in the first round of the scheme last year to install a climbing wall for young people in the town to use. Applications for the Localities Bid Fund are being accepted until 5pm on Thursday 28 February. £296,000 is available across five localities. “We applied for £8,000 for a traverse climbing wall and we were awarded the full amount. We added a bit of our own funds to top that up and we got an exciting new wall to put in our games hall for the young people to utilise. An assessment panel will meet to assess the applications submitted and if an application successfully meets the criteria it will be put to a public vote with the other eligible bids in each locality. Councillors recently approved an updated version of the scheme, which has seen the entry criteria relaxed.